Children's Hope International: Telling Your Story: "Chat Over Coffee"
Telling Your Story: "Chat Over Coffee"
You are your best story and one of the greatest ways to celebrate and advocate for the world's orphans. As an adopting or adoptive parent, your heart is big for the orphan and how your heart became prepared in this way is a story that is as deep and wide as this love. There are so many ways to share this. Telling Your Story - "Chat Over Coffee"
So far during National Adoption Month, 10 Children's Hope Family Volunteers have stepped up to lead information meetings in their area. (We are so thankful to our CHAPs families!) Most often Family Volunteers ask their local library for space and our staff coordinator helps promote their meetings through the family's local newspaper. The neatest idea being used this month is "Chat Over Coffee", an opportunity for prospective parents interested in adoption to meet families who are experienced in all that adoption is, both the challenges and the rewards - all over a simple cup of coffee. These meetings are personal and really help you connect with those that are about to enter your shoes, to adopt a child. You have and are making a difference in the life of an orphan. Let others know how they can, too. If you are interested in leading a "Chat Over Coffee" or more formal information meeting, contact Ginny Burkhart at Ginny.Burkhart@ChildrensHope.net. She'll help you with everything you need. 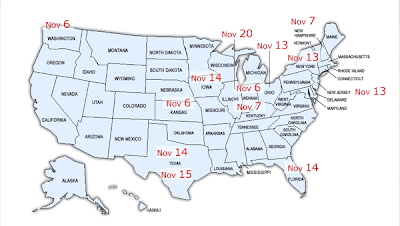 Check out the map above for dates of meetings near you. Click on the picture to take you to our Meetings web page.